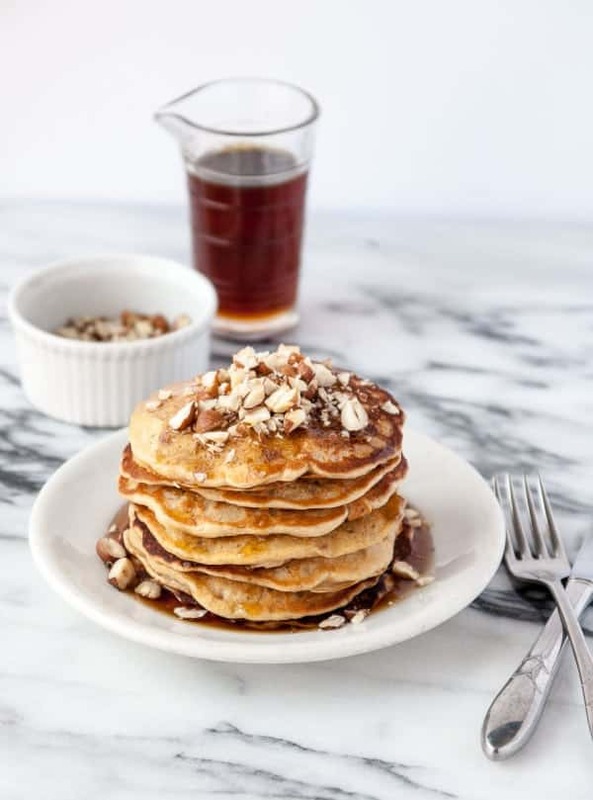 Vegan banana hazelnut pancakes are a perfect addition to your next brunch, just add coffee! Banana pancakes hold a special place in my heart because were one of the first things my husband cooked for me when we started dating. He presented it as ‘his specialty’ and insisted that I had to try them next time I came over. Well, if his plan was to hook me in with his breakfast skills, he won, because dang, those pancakes were GOOD. If this guy can make breakfast, well, I guess I’m in (also, I convinced him to get a cat after he was a self proclaimed cat hater, so it’s all about compromise, right?)! After finding out that he liked to make pancakes and that I also loved brunch/breakfast, Sunday typically became our make-a-giant-breakfast-and-lay-around-the-house day, especially since it corresponded with the day that had the most football on in the fall and was the day we both had off together most of the time we were dating. They were the perfect, lazy Sundays that I now typically use for blogging things (and helped me tolerate an entire day of football) and figure out that we both love a good lazy day, especially when it involves vegan banana hazelnut pancakes. The two things I love the most, food and sharing it with someone you love, ALL the warm warm fuzzy feelings. 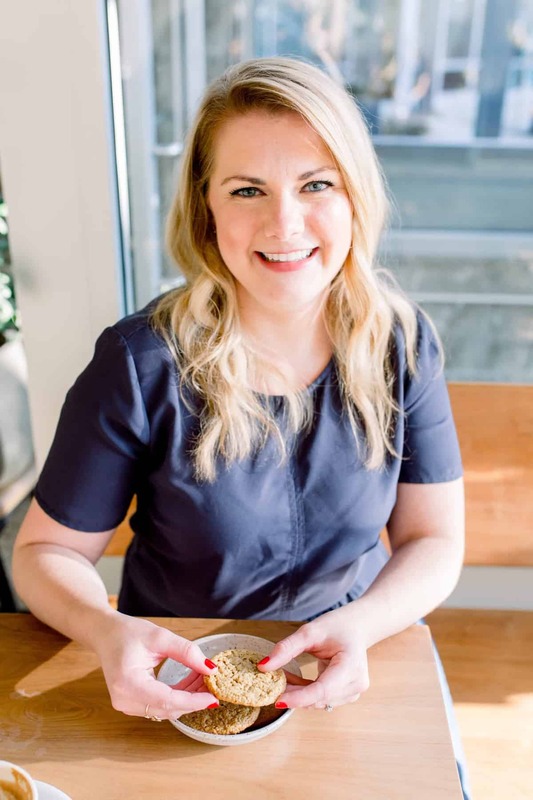 The base of this recipe comes from Cookie and Kate, who has mastered the art of the simple vegan pancake (she has an awesome vegan waffle recipe too! ), so I won’t even try to mess with it at all. I’ve honestly struggled with getting pancakes just right for a while now, either burning them or having them come out soggy in the middle, but Kate’s recipe yields a perfect batch every time. I would recommend thoroughly mashing your banana so you don’t end up with lots of weird chunks that might turn the pancakes lumpy and soggy, I used a fork and it turned out perfectly. Also, don’t be like me and turn up your skillet way high before cooking because, somehow, in your head, that made sense, it doesn’t! Just keep it at medium/medium low and you will get that golden on the outside, fluffy on the inside texture that is the pancake holy grail. Vegan banana hazelnut pancakes are the perfect addition to your next weekend brunch! 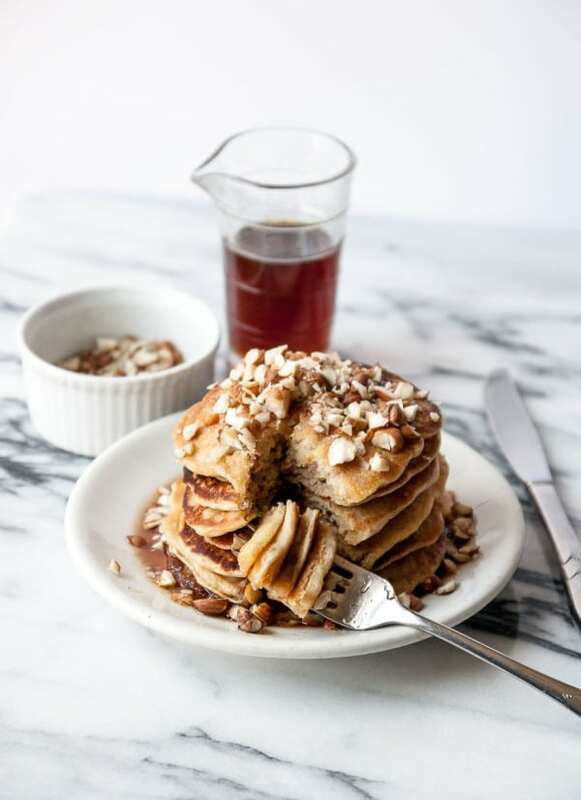 The best simple vegan pancakes studded with hazelnuts and banana. In a small bowl, whisk together the flour, baking powder, and salt, set aside. In a medium bowl, whisk together the almond milk, melted coconut oil, mashed banana, cane sugar, and vanilla extract until blended. Stir in the flour mixture, stirring until no flour remains. Fold in the hazelnuts and only mix until incorporated. Heat a cast iron skillet over medium low heat and grease lightly with coconut oil or spray. Make sure the skillet is ready for cooking by dropping a bit of water on the skillet before cooking, if it sizzles, you are ready to go! Measure pancake batter out onto the skillet by 1/4 cup and cook until bubbles start to form on the edges and top of the pancakes, which should take 2-3 minutes. Flip pancakes and cook for an additional 2 minutes. Repeat cooking the pancakes until all the batter has been used, greasing the pan between batches. Awww…a man that makes you pancakes is a total keeper. But you already know that. :-). I love these photos, Abby! GAH – you’re making me want to bust out my tripod (I’m so lazy though). Such a sweet story, and I’m with Liz, that’s when you know you have a total keeper! 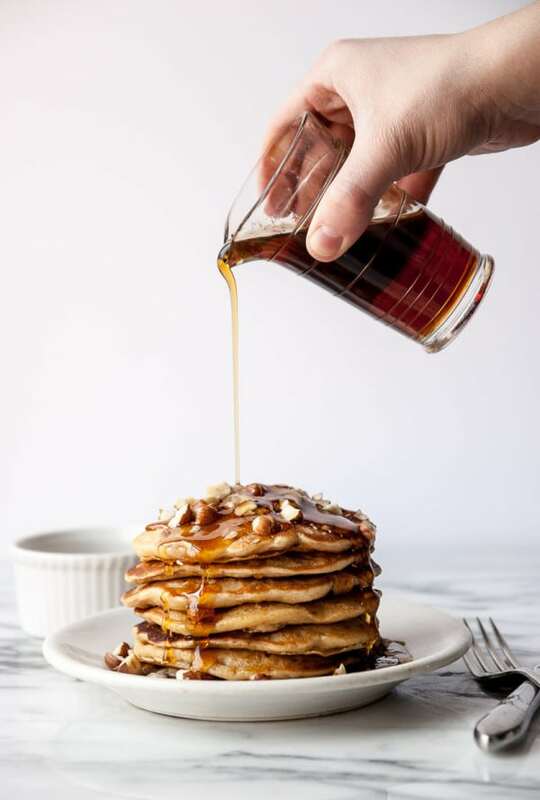 These pancakes look incredible and that syrup shot – so good!! I’ve had Kathryne’s base recipe so I cannot wait to make this version! xo. These look so comforting and I love the hazelnuts! I agree Rebecca! Hazelnuts are SO good, why don’t I use them more?! Pancakes are seriously one of my favorite foods! 🙂 Breakfast. Lunch. Dinner. Snack. Anytime really. 😉 These are ridiculously gorgeous…love the recipe! Will be whipping these up this week! Thank you Caroline! They are a favorite here too, especially with bananas! Pancakes are a weekend favorite around here! We need to try these soon! It’s what makes weekends the best! Oh golly, I’m drooling. 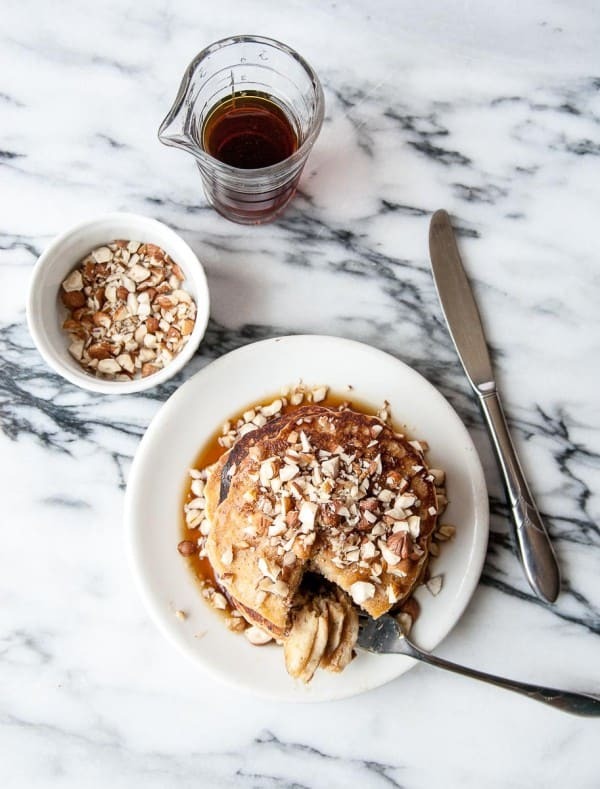 I love pancakes more than life itself sometimes…and love that you used coconut oil, I do the same! It just works so well! Ha yes, don’t be subtle! I’m glad we aren’t the only ones, love it! Hi Nina, yes, that would be fine to sub those in! Lovely recipe! Was wondering if I could use whole wheat flour? Do you think that’ll make them too dense? Hi Santina! It should work fine with all whole wheat flour, you just might want to add a tad more liquid to make sure they aren’t too dense! Wow, I see a very lazy Sunday coming up, filled with these beauties! Thanks for sharing, Abby, can’t wait to give these a try. Enjoy! They are my absolute favorite! hazelnut pancakes is tasty in taste and you can easily eat with the cup of tea.